We were also so lucky to get a villa right on the beach. Flamenco beach has super clear waters and is part of a Natural Reserve area, so beyond the set of villas we were in, and the one next to us, we had the beach to ourselves at night after the day-trippers took the ferry back to the main island. It was magical seeing the sunset and then watching the stars from the beach. One of the unique things about Flamenco Beach is that the beach is like a cove with the beach arching around like a horseshoe. That is what I captured in the Puerto Rico Wedding invitation. The villas we stayed at along with the beautiful beach would make this an ideal location to get married. 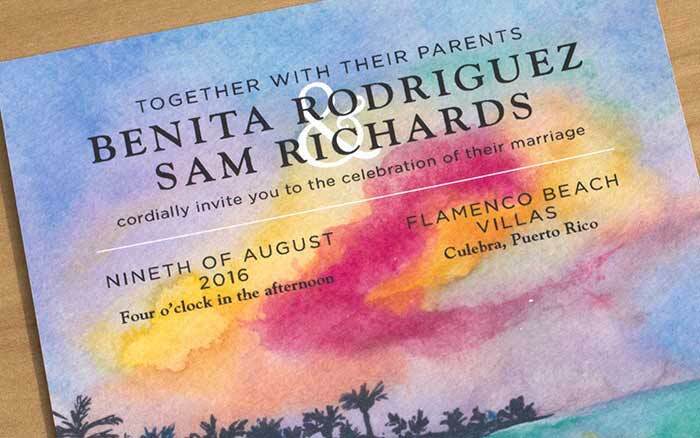 This design is ideal for destination wedding invitations as well. 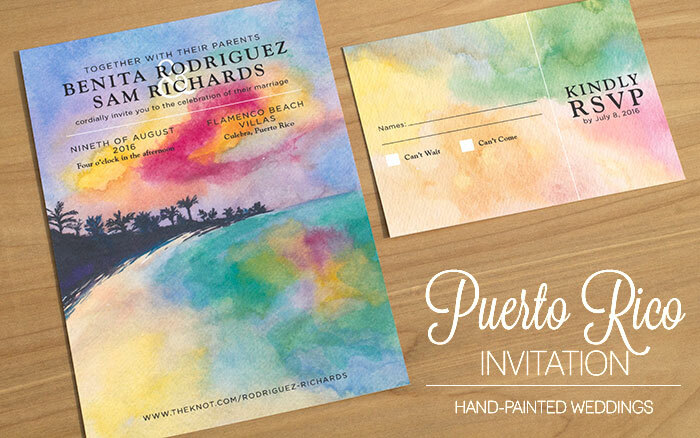 While I am calling this beautiful beach invitation a Puerto Rico invitation, because that is where I gained the inspiration for this painting, I am sure this would be an ideal design for any couple’s beach wedding invitation.